Choosing the right scratching post for your cat can be a stressful occasion. There is typically a high cost involved and there is no guarantee your cat will even like the thing once you bring it home and get it set up. That’s why we scoured the internet looking for the most popular scratching posts that have already been well-received and reviewed by felines around the world. This way, you can be sure that you are purchasing a durable product your cat will have trouble resisting sinking their claws into! Of course, just because other cats like it, doesn’t necessarily mean yours will – so we tried to include as much information as possible, because when you’re making an informed purchase, it’s way more likely that you’ll find something perfect for your home! You know your cat, and you probably already have a good idea what they’ll gravitate towards. At the end of the day, cats like scratching posts, so find one that fits your budget, looks nice in your home, and you’re already most of the way there. This cat scratching post measures 19 x 19 x 41 inches and is covered almost completely in sisal fabric – the ideal choice when choosing a scratching post for your feline friend. This is about as basic as a scratching post can get, but why change a good thing? It’s the classic style, it’s stable, it works great, and it’s strong enough to keep your cat busy scratching for a long, long time. The base is a 19 inch square, so it’s plenty sturdy and not at risk of tipping over, especially when your cat is standing on the base. It’s big enough to be a fit for all sizes of cats, but it also isn’t going to take up an entire corner of your house like some of the bigger, super fancy cat trees. If you’re looking for a fairly simple option that gets the job done, doesn’t stand out or look too tacky, is very reasonably priced, high-quality, and that will help save your furniture – this is basically the perfect post to get. We’ve got a lot of others to look at still, so if this doesn’t quite fit your fancy, don’t worry! It’s quick to assemble and comes with the necessary tools needed to put it together. Reasonably priced and comes with a 1-year MidWest quality guarantee. It is well-constructed using sisal fabric and neutral colors, so you don’t need to worry about it clashing with your decor. The sturdy base that keeps it from wobbling during use. This is important because it makes your cat more likely to use it. The sisal fabric – not to sound like a broken record here but sisal is long-lasting and provides cats the satisfying scratch they’re looking for! This scratching tower from TRIXIE measures 17.5 x 17.5 x 31.5 inches. Three sides of the tower are covered in sisal rope, giving your cat plenty of room to scratch with the last side reserved for the included toys. This scratching post is about ten inches shorter than the first one on the list, so if you wanted to put it under a tall desk/table, or if you have a shorter cat, this could be a good option, but cats that like to stretch out more would probably appreciate the taller Forte model by MidWest that’s featured above. It’s affordable and offers ‘more bang for your buck’ with the additional toys. Except for a few isolated cases, it seems well made and holds up well to most cats. Take care to assemble it properly, and it’s a good idea to check on it every now and then, just to make sure it isn’t starting to loosen up. A little bit of maintenance goes a long way. It has a wide base that is almost impossible for most cats to knock over. The included toys! Most scratching posts don’t include toys so it’s nice to see something a little different for our feline friends. It might surprise you to find out that Amazon sells an AmazonBasics cat scratching post but here it is! 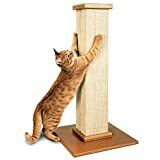 Their premium cat scratching post measures 15.8 x 35.4 x 15.8 inches and is a hit among cat lovers and their feline companions. AmazonBasics sells products in just about any category you can imagine, and if you’ve ever tried them out, they live up to the name. They’re always very basic, but they’re also always very well-made and offer amazing value. 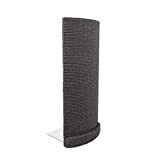 The Premium Post by AmazonBasics is available with either a gorgeous wooden base, or with the base covered in a soft, plush fabric. In either case, this square-shaped post looks great in any room. It kind of looks like a pillar. There’s a little fluffy ball attached to the top that your cat get a kick out of playing with too, so that’s a nice bonus! The neutral design. Compared to some cat scratching posts you’ll find, it looks modern and won’t stick out like an eyesore. It’s durable and long-lasting so you won’t need to worry about replacing it right away. It uses jute fiber instead of sisal rope. It is just as durable and is a great way to keep your cat’s nails healthy. It has a sturdy wooden base that is difficult to tip over making it more appealing to your cat. The replaceable dangle toy. Toys are important for mental stimulation, so we like that this scratching post comes with one that can be replaced as needed. The popular SmartCat Ultimate Scratching Post measures 16 x 16 x 35 inches providing plenty of room for your cat to stretch vertically while taking care of their nail health and natural urge to scratch. It’s also square in shape like the AmazonBasics model. It feels like a step-up in terms of quality, and it looks a bit nicer too. Either of these two would make a great choice, but we have to give the edge to CatSmart here. Another difference between this model and the AmazonBasics one is that this one from SmartCat uses sisal rather than jute fiber. Sisal is the standard you’ll find on nearly every other post. The Basics post is available with a bare wooden base or covered in soft fabric, whereas this one is just the one style – wooden. Even though it costs more, we’d still lean towards this one, but if you want to save some money and still get a great square scratching post, AmazonBasics is still an excellent alternative. The beautiful design with sleek wooden base – it really looks more like a piece of furniture than a cat’s scratching post! It’s easy to put together using the included hardware and durable for long-lasting use. The tall height. It’s perfect for larger cat breeds who have been too long to fully stretch out while using other scratching posts. It’s fully covered in sisal rope ensuring your cat gets plenty of use out of their new scratching post. If your cat loves scratching up your sofa, this is a great scratching post to try! With its unique shape, it contours perfectly to the corner of most sofas to help dissuade your cat from scratching up your expensive furniture. It measures 24 x 10 x 10 inches. This is different than the typical post, but we just had to include it because it’s such a unique and worthwhile product. We have friends who have bought their cats post after post, but the cats just keep going back to the corner of the sofa. This soft corner scratching post gives the cats something else they can scratch that won’t damage your sofa, while still allowing them to scratch in the exact place they like to. You may not be able to find a color that matches your couch perfectly, but there are enough options that you should be able to find something that’s close enough, at the very least. The shape – it really helps protect those precious couch corners that are otherwise a target for your cat’s claws. It’s available in a variety of neutral colors so you’ll have no trouble finding one that will match your decor and sofa color. It has an ultra-thin base that can be anchored to your sofa, making it almost impossible to knock over. It’s completely covered in high-quality woven sisal rope so it’s a durable choice that should have no trouble holding up against your cat’s claws. What is the best material for a cat scratching post? Most scratching posts are covered in sisal rope. Sisal is affordable, and cats seem to be drawn to it, but most importantly it is durable and can handle a lot of abuse from a cat’s claws before needing to be replaced. Some other popular choices are corrugated cardboard and jute fabric. How do I encourage my cat to use his scratching post? You can help encourage your cat to use his scratching post by placing the post near or against your furniture that your cat has loved scratching in the past. You can also sprinkle some catnip on the post to help pique your cat’s interest. Do cats need a scratching post? No, cats don’t need a scratching post, but we highly recommend one if you want to lessen the chances of your cat taking their claws out on your expensive furniture. After all, cats have a natural urge to scratch and it helps keep their nails trim and healthy, so you should be providing them an outlet to do so. A good post is going to feel better, in most cases, than your furniture will, so they’ll be happy to use it instead. How to choose a scratching post? When it comes to protecting your furniture and respecting your cat’s natural urge to scratch, a scratching post is an absolute must. Like most products, quality matters and you’ll want to look for something that is sturdy and uses a cat-friendly material like sisal. All the scratching posts on this list meet that criteria and will be well-received by most of our feline friends. 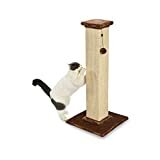 Style-wise, there’s a simple and classic design that you’ll notice in a lot of these scratching posts and towers for cats, but you’ll find a few that definitely stand out from the pack. Simple posts work great for people who don’t want a large cat tree in their house, and there’s really only so many ways to design a base with a pole attached to it. Beyond that, it comes down to material, price, and size, so unless one of these posts stands out to you looks-wise, those are the most important criteria to keep in mind. If you do find one of them that looks better than the rest, that’s a good trait to prioritize, since every post on this list surpasses our high-standards for value and quality, so you may as well get the one that suits your decor and personal style. Enjoys eating well and a healthy lifestyle, although is partial to a good butter chicken. When not working on the computer Simon will be outside with the dogs mowing, pruning or weeding the garden.